When you are the host on Thanksgiving you are doing most of the work, and most of that work is being performed in your kitchen. You spend the day re-creating favorite family recipes passed down through generations and adding in a few new ones. While you are putting together one of the best meals of your year, the hard surfaces in your kitchen can take a beating. With the large volume of food and variety of different ingredients, there is going to be a spill or two. Some of these ingredients, when left unattended for long periods of time, can take a toll on your kitchen. It is not uncommon to notice a tough stain or spill after dinner is enjoyed and all the guests have gone home. After a long day’s work, no one wants to spend the next day scrubbing and cleaning. After getting the dishes out of the way and some light wipe downs, why not treat yourself to hiring a professional to get down to the nitty, gritty, deep cleaning of your kitchen’s hard surfaces? A professional deep cleaner can expertly clean stains as well as dirt that is unseen and apply sealant to help protect surfaces from future spills and stains. Don’t hire just any cleaner offering a holiday special though, make sure you are hiring a reputable and trustworthy cleaning company to do the job. There are many companies claiming to have professional cleaners, but don’t perform actual professional quality work and end up causing damage and costing you more money. When booking an appointment with a professional hard surface deep cleaning company don’t be afraid to ask questions about their equipment, cleaning solutions, cleaning process, employee training process, insurance, satisfaction guarantee and pre-cleaning written quote. A trustworthy cleaning company will be happy to openly answer all of your questions and provide you with proof to verify their answers. They will have highly trained personable staff and professional truck-mounted equipment to get the job done correctly. They will provide you with a quote for every service you need and a satisfaction guarantee before they perform any work in your home. 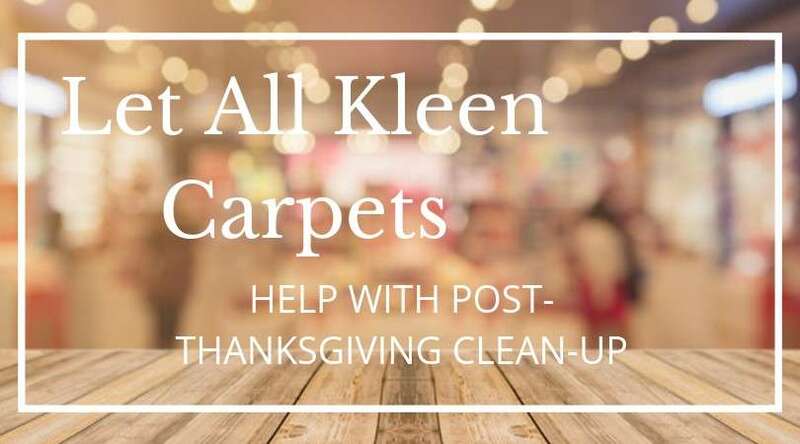 This Thanksgiving, enjoy the time with your family and let a reputable cleaning company worry about the tough clean-up work. There is no better way to reward yourself after your hard work than by hiring someone to get your kitchen its cleanest clean, and hiring the right people to do the job will set your mind at ease. For deep hard surface cleaning you can trust in Everett and surrounding areas make an appointment online or over the phone with All Kleen.